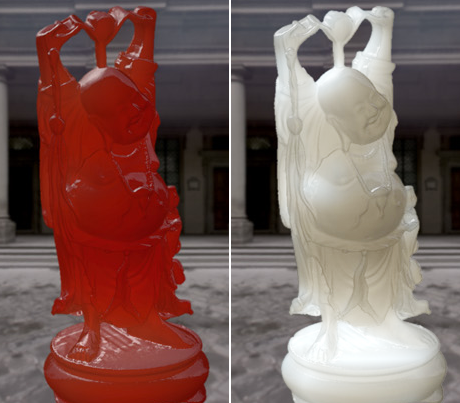 Existing subsurface scattering rendering algorithms try to reproduce the phenomenon aiming at physically accurate results. Recent research has demonstrated that in some scenarios, to make some assumptions about the way we perceive translucency helps us speeding up calculus achieving real-time results. In this paper we present a new algorithm based on previous perceptual studies general enough to work with measured and user-defined data. The results obtained make the algorithm interesting in scenarios were a plausible appearance of translucency is enough. This research has been partially funded by the Spanish Ministry of Science and Technology (TIN2007-63025) and the Gobierno de Aragón (projects OTRI 2009/0411 and CTPP05/09). Jose I. Echevarria was additionally funded by a research grant from the Instituto de Investigación en Ingeniería de Aragón.